Strollers are a must-have when you’re expecting twins. But because there’s a dizzying array of choices out there, it’s no wonder first-time parents get nervous about choosing the best twin side by side stroller for their little ones. Looking for the right stroller for your babies shouldn’t be complicated. If you’re expecting twins or if you already have a baby and have another on the way, this guide will help you figure out how to choose a good side by side stroller so that you get your money’s worth. We also share our top picks for the most durable and practical twin side by side strollers for your family. 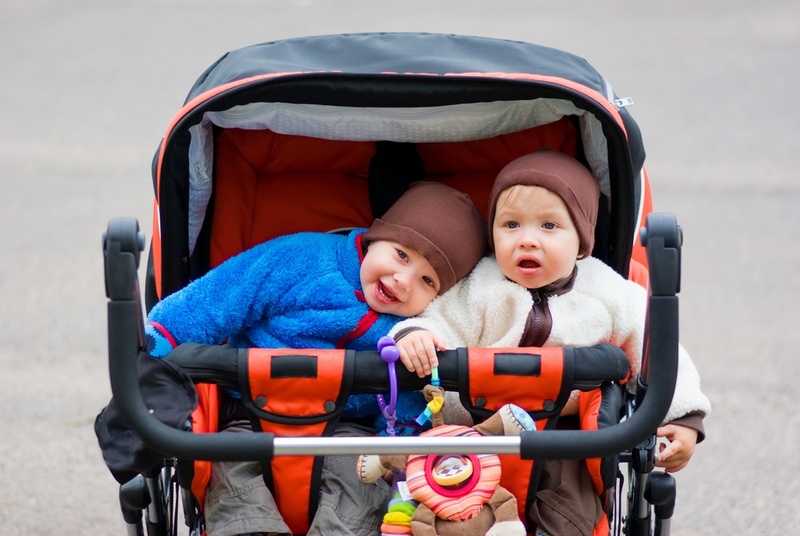 Let’s start with why you should get a side by side stroller for your twins. If you’re expecting twins or have two babies close in age, you will need a twin stroller so that you can get around or run errands with them when your partner is unavailable. There are different types of double strollers: tandem, side by side, all-terrain, sit-and-stand, double jogging stroller, etc. Side by side strollers are the most popular choice for parents of twins. This is also our top pick, especially if you will be using them for infants. A twin side by side stroller consists of two seats that are positioned next to each other. These strollers offer their passengers identical experiences — same view, same seat size, same recline options, etc. The great thing about a twin side by side stroller is that it is very comfortable for your babies. In it, they can stretch their legs and lean back as much as they want. Because the seats are side by side, your twins can interact while they sit in the stroller and one glance is all you need to see how both of them are doing. The downside is that side by side strollers are really wide and may not fit through some doorways. When shopping for a twin side by side stroller, you need to think about what features are important to you and your family. The most useful ones are reclining seatbacks, roomy storage bins, one-touch folding mechanisms, sun shades, and adjustable leg rests. Some double strollers are more suited for babies close in age (and size) while some are designed for use by families with a toddler and a baby. Side by side strollers are ideal for families with twins. This is because side by side strollers can pull to one side and tip if the weight is not distributed evenly. If you’re thinking about getting a twin side by side stroller for your children, consider the ages of your babies. Will you be using the stroller for newborns? Or do you have a newborn and a 2-year-old? Aside from the ages of your children, you also need to consider the car seat compatibility of the stroller, as well as the weight limit. If you have an older child, look into whether or not you can attach a standing board to the stroller. Side by side strollers are about twice as wide as the regular stroller. Though these types of strollers are known to be clunky and cumbersome, many new models are actually quite compact and are able to pass through doorways, elevators, and narrow hallways. Nonetheless, before you buy a twin side by side stroller, check the dimensions and make sure it will fit inside the trunk of your car. Using a side by side stroller for the first time is often compared to test-driving an SUV when you own a compact car. If you live in a highly urbanized city and have to navigate crowded sidewalks on a regular basis, you need a stroller that’s easy to move around. When you’re looking for a side by side stroller for your twins, test-push your top choices. Can they fit through doorways and turn corners fluidly? Can you move them through narrow store aisles and cut corners with them? Do you live in the city, the suburbs, or somewhere in between? Do you like to go to the park, jog, or run errands? When looking for a twin side by side stroller, think about where you will be using it and what types of activities you will be doing. If you live in the country or in the suburbs, size won’t be much of an issue because you’ll have more space for manoeuvring and fewer elevators and crowded aisles to navigate. If you like to jog or hike, consider getting a jogger or all-terrain side by side stroller. If you live in the city and your twins are bigger, you may consider using an umbrella side by side stroller. You should only buy strollers that show the logo from the Juvenile Products Manufacturers Association, which tells you that it has passed the strict safety standards of the ASTM. Check the stroller for essential safety features like a sturdy restraint system and parking brakes. Look for a canopy with a “peek-a-boo” window, wheels that are properly aligned and sit uniformly on the floor, and a secure footrest. Trying to get around with two babies and a larger-than-typical stroller is hard enough, so you’ll definitely want to have a stroller that makes your life even just a tad easier. It’s important that your side by side stroller is easy to fold, lift, and push. You don’t want to have to wrestle the stroller in an attempt to fold it and get it inside your car or an elevator. If one of your babies drops a bottle or a pacifier in the middle of a crowded sidewalk, you want to be able to easily and quickly swivel the stroller around. Before you buy a stroller, make sure you can easily fold it with one hand and that it is light enough to lift on your own. If your family spends a lot of time outdoors, this excellent double jogging stroller is a great inexpensive option. The Baby Trend Navigator is one of the lightest jogger strollers on the market and its narrow frame makes it easy to maneuver. You can use this stroller from early on because it can accommodate two Baby Trend infant car seats. This stroller ensures your babies’ safety and comfort with locking front swivel wheels, 5-point harnesses, and multi-position reclining padded seats. Parents will be happy as well, as this stroller includes a convenient parent tray that has MP3 speakers, a couple of cup holders, and a covered storage compartment. A trigger folding mechanism allows parents to quickly fold, transport, and store the Baby Trend Navigator. The large storage basket underneath the seats is great for diaper bags, groceries, and other items. The Joovy Scooter X2 is a popular twin stroller whose main features include a sturdy graphite frame, a compact size that lets you breeze through standard doorways, a generous storage basket, and one-handed fold. It may be a budget option, but it definitely offers great value. This stroller was designed for maximum comfort. A few of the features we love are the reclinable seats, independently adjustable footrests, removable bumper bar, and the huge canopy that protects your babies from sun, snow, and rain. The enormous storage compartment is particularly helpful because babies do come with a whole lot of stuff! The X2 also boasts extra large wheels that are designed for a smoother ride over concrete, dirt, grass, sand, and more. The wheels have sealed bearings and linked parking brakes. The Joovy Scooter X2 can accommodate children up to 45 pounds each or a total of 90 pounds. Parents love this stroller because there are two cup holders and two zippered pockets for keeping your wallet, phone, and other valuables safe. This umbrella stroller from Joovy is all about being lightweight and portable. At just 26 pounds, this is definitely one of the lightest side by side strollers you can find today. Despite being extremely light and compact, this mighty umbrella stroller can accommodate your twins up until they’re 50 pounds each. What we love about the Joovy Twin Groove are the near-flat recline, waterproof material, and the generous canopy with “peek-a-boo” window. This stroller is easy to collapse and transport with the compact standing fold mechanism and shoulder carry strap that sits comfortably on your shoulder. For parents, there are three cup holders and two zippered pockets for phones and valuables on the back of the stroller. On-the-go parents will appreciate the six-wheel suspension, safety reflectors, and in-seat mesh pockets for storing toys, snacks, wipes, bottles, and other baby essentials. All in all, this is an inexpensive option that doesn’t feel “budget” at all. The Baby Jogger City Mini Double Stroller is popular among active parents because it combines the smooth ride and higher speeds of a jogger and the comfort and convenience of a regular double stroller. The construction ensures that the stroller lasts for years, even with heavy use, and the whole thing is just really stylish! Even better, this versatile stroller can be transformed into a pram or a travel system with the addition of accessories like a cooler bag or a parent tray. Some of the best features of the Baby Jogger City Mini are the patented one-touch fold mechanism, comfortable padded seats, large under seat basket, vented seat tops, and the huge sun canopy with “peek-a-boo” windows. The stroller stands on its own when folded. You can even lock it in place so that it stays compact. The front wheel suspension soaks up bumps and ensures a smoother ride while the durable aluminum lets you easily push, fold, and transport the stroller. With that, we hope you can now choose the best twin side by side stroller for your children. Remember to decide based on safety, comfort, durability, and solid recommendations from people you know instead of going by brand name and style. Good luck!